Florence + The Machine is a relatively rare and interesting type of multi-million selling global superstar to be found in this or even the past decade. She is more suited to the mid-eighties/nineties stretch of pop stars that included Kate Bush, Prince and Bjork -- artists that used idiosyncratic and sometimes iconoclastic imagery that was key to their success but didn’t define it and whose music was frequently strange and brilliant but sold by the shed load. Where Florence Welch differs from her idols though is that her musical choices so far have found the singer already approaching what could be regarded as caricature of herself. Her debut album “Lungs” was a rag-tag but solid collection of goth-pop which established her eclectic eccentricity and 2011’s highly polished “Ceremonials” had some fantastic songs which were often marooned in a samey, shouty and exhaustingly one-note soundscape. “How Big, How Blue, How Beautiful” sees Florence set out to actively change this, to breath nuance and restraint and personal experiences into an album’s worth of songs. Markus Dravs has taken over almost all production duties from Paul Epworth (who still co-produces one track here) and has laid down the law, it seems, telling Welsh that certain well-worn subjects are off-limits, such as water metaphors (a few still slip through the net, excuse the pun) and an early song called “Which Witch” bought to him by Welch was rejected because of song title only (and that too still appears, but as a bonus track only). He wanted to put her voice up front and to be more exposed and vulnerable, less multi-tracked, and for the music to also have space to breathe. Will Gregory, the introvert half of Goldfrapp, was bought on board as Welch wanted lots of brass and she’s certainly got her wish. 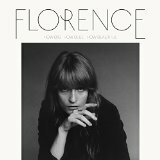 It seems that there was some compromise on both sides, as this is a different Florence album in part, but it is not to be considered as any real, radical departure in sound. With the strength of songwriting on display here and a successful transition to more interesting and diverse soundscapes this is not important, it’s the most balanced and cohesive album that Welch has made thus far. The first song to be heard from “How Big, How Blue, How Beautiful” was the striking “What Kind of Man”. With Welch’s voice manipulated to echo that of Karin Andersson from The Knife, she sounds genderless and possessed and it’s something of a shame that guitars and drums crash in all too soon. The mania and panic associated with Welch and evidenced here again is offset beautifully by a return to the coolness of this initial refrain though and “Ship to Wreck”, with its soaring near gospel middle-eight, continues with the indie rock motifs . The title track’s opening line ‘between a crucifix and the Hollywood sign’ is not the only thing that sounds like you might hope a Madonna track would in 2015; it has a spaciness and warmth that is designed to be heart- swelling and it is. The long instrumental play-out is the most optimistic that a Florence track has ever sounded, assertive trumpets and forthright strings herald a new dawn with all of its possibilities. Sounds cheesy perhaps but it’s sincere and as gorgeous as hell. “Various Storms & Saints” and “Long & Lost” continue with an acoustic, bare bones but lush instrumentation and “Caught” is a mid-tempo r’n’b song with an unexpected country sway and is swoonsomely heartbroken. Over a plaintive organ and understated orchestration it is “St Jude” which cements absolute melodic perfection with Welch’s forever fallen angel, compulsively drawn to chaos. “Delilah” and “Third Eye” will delight the Florence diehards with both tracks pulling across the established, bombastic and commercial sound from her previous two albums and turning the dial up even further to not-quite ludicrous settings. Album closer “Mother” incorporates all of these ingredients but stirs them about with a 1970’s blues-rocker shtick that creates something altogether more strange and the final, thrashing fifty seconds genuinely excite. Florence + The Machine may never be able to do subtle but with “How Big, How Blue, How Beautiful”, Welch has made considerable progress with making music that is more complex, satisfying and timeless sounding than before, never alienating her current fan base and undoubtedly attracting many more new ones in the process.